Not only can your R.E.D. 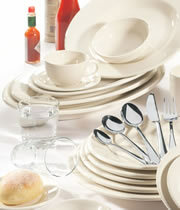 Canada distributor assist with all your equipment planning, but we can also provide your cookware, china, cutlery and glassware. Our professionals can assist you in designing a smallwares package to complement your decor. Choose from several leading manufacturers, that offer the highest quality products. View our Approved Suppliers page for a full listing of the brand names we offer.